The Russo-German War in general, and armoured combat on the Eastern Front in particular, have remained popular subjects in English-language historiography of the Second World War for the past six decades. However, much of what Anglo-American readers know or think they know about armoured warfare on the Eastern Front has been shaped by self-serving memoirs such as Guderian’s Panzer Leader or von Mellenthin’s Panzer Battles, or popular wargames such as SPI’s Panzerblitz (1970) and a new generation of computer wargames. A cult of German tank-worshippers has arisen and its members are now firmly entrenched in their belief that all German tanks (meaning their beloved Tiger and Panther series) were better than any Soviet tanks and that the Red Army’s tank forces only prevailed because of numerical superiority. There is a grain of truth in this argument, which was fostered by German veterans seeking to perpetuate the Third Reich’s propaganda-line that the victory of the Red Army’s `barbarian hordes’ was due to mass, not skill. However, the quantity over quality argument ignores a variety of critical factors encompassing the opposing war-fighting doctrines, strategic miscalculations and terrain/weather that significantly influenced the outcome of armoured operations in the East. Key facts, such as the German inability to develop a reliable diesel tank engine while the Soviets had one in production before Operation Barbarossa began, are often just ignored – even though it had a significant impact on the outcome of mechanized operations on the Eastern Front. Yet material factors were not the only influences upon armoured warfare on the Eastern Front. Napoleon’s dictum that, `in war, the moral is to the material as three is to one,’ proved quite apt on the Eastern Front of 1941-45, with a host of moral and non-material factors influencing the outcome of battles and campaigns. Looking across a hexagonal grid super-imposed over a two-dimensional map sheet, cardboard counters or plastic miniatures representing German Panthers or Tigers look so much more impressive than the opposing Soviet T-34s. The German tanks’ strengths – long-range firepower and armoured protection – carry great weight in these kinds of simulations, while their main weaknesses – poor mobility and poor mechanical reliability – are only minor inconveniences, if depicted at all. For example, the oft-repeated canards about the Panther’s `teething problems’ at Kursk are fobbed off as a temporary issue, costing a wargamer a few movement points, without realizing that the Panther had persistent mobility issues throughout its career that prevented it from conducting the kind of wide-ranging mobile operations required by German maneuver warfare doctrine. The main strengths of the Soviet T-34 – reliable mobility over vast distances on its own tracks and suitability for mass production – are factors that lie outside most tactical-level simulations. Consequently, two generations of Anglo-American history buffs have been presented with numerous simulations that emphasize the superiority of German tanks and the cannon-fodder nature of Soviet tanks. The Cold War also played a role in shaping perceptions, with a large number of German veteran accounts that were often viewed uncritically, while there was a dearth of useful accounts from the Soviet side. When available, Soviet accounts were routinely discounted as lies or propaganda. After the collapse of the Soviet Union, fifty years after the onset of Operation Barbarossa, this ingrained Western perception began to change as previously unavailable historical material emerged from Soviet-era archives, but the balance of Eastern Front historiography in English is still heavily biased toward the German perspective. Another problem in evaluating armoured warfare on the Eastern Front is that much of the analysis to date has been fairly tactical in nature, focusing on a single campaign such as Stalingrad or Kursk, which tends to gloss over the impact of long-term trends that shaped each sides’ combat performance. The Russo-German War lasted for forty-six and a half months. It was not decided by a single battle or campaign. Adolf Hitler intended to crush the Soviet Union and its inimical Communist ideology in one, swift campaign, using his battle-tested panzer divisions and Luftwaffe air fleets as his weapons of choice. In Führer Directive 21, issued on 18 December 1940, Hitler stated that, `the bulk of the Russian Army in Western Russia will be destroyed by daring operations led by deeply penetrating armoured spearheads.’ He deliberately chose to unleash a war of annihilation aimed not only at the destruction of the Red Army and Soviet state, but also at the eventual obliteration of the indigenous Slavic populations as a necessary precursor to German colonization in the East. Whereas previous operations in Poland, France and the Balkans had followed the methods of traditional German campaigning, Hitler intended Operation Barbarossa to be a crusade. Yet oddly, Hitler’s grand strategic vision for the War in the East was not matched by sound strategic-level planning. Instead, the War in the East would be conducted primarily on the operational and even tactical levels, often on the basis of ad hoc or opportunistic decision-making, rather than sober assessment of ends and means. The employment of Germany’s armoured forces in the Soviet Union was shaped by three strategic assumptions made by Hitler and the Oberkommando der Heer (OKH). The first assumption was that the war in the Soviet Union would be a short campaign, resolved in a matter of a few months. Germany made no preparations for a protracted War in the East, including increasing tank production or training replacements, or stockpiling fuel and ammunition. The second German strategic assumption was that terrain and weather would have no significant impact on the conduct of the campaign. Hitler and the OKH regarded the Soviet Union as virtually flat, table-top steppe land that was perfect for rapid panzer operations, but ignored its numerous rivers, dense forests, immense distances and poor road networks. Previous German panzer operations had achieved victories after moving only 300-400km in fair weather over good roads. Indeed, no offensive in German military history had ever covered more than 500km in a single push. Since the first assumption of a short war expected a Soviet collapse well before the onset of the Russian winter, Hitler and the OKH completely disregarded the weather as a factor. The third strategic assumption was that the Red Army could be quickly and efficiently destroyed. Based on a combination of factors – the poor showing by the Red Army in the Russo-Finnish War, Stalin’s purges of the officer corps and incomplete OKH intelligence assessments – Hitler and the OKH reckoned that they could destroy the best part of the Red Army in about six weeks of fast-moving campaigning. With the bulk of the Red Army smashed, including its tank forces, Hitler believed that the Soviet state would suffer a moral collapse akin to what happened in France in June 1940. These three strategic assumptions had a profound impact on German panzer operations in the Soviet Union and when each proved false in turn, they put the panzer divisions at a permanent disadvantage. Stalin’s immediate objective in mid-1941 was to deter German aggression until the Red Army was sufficiently prepared for him to take a more assertive tack with Hitler. He had foolishly ordered the disbanding of the Red Army’s four existing tank corps in November 1939, only to order them re-formed as mechanized corps in July 1940 and their number doubled in response to the spectacular German victory over France. In order to give Soviet military power credibility in the eyes of Germany, Stalin also directed that the mechanized corps would be reequipped with the new T-34 and KV-1 tanks to replace the lighter T-26 and BT-series models. Soviet industry was ordered to produce over 5,000 of the new tanks and the mechanized corps were expected to be fully-equipped by mid-1942. However, Stalin became increasingly alarmed by reports that Germany was creating more panzer divisions, so in February 1941 he directed that twenty additional mechanized corps – requiring another 11,000 tanks – should be formed as quickly as possible. Even with the Stalingrad Tractor Plant (STZ) joining the Kharkov Plant (KhPZ) to produce T-34 tanks, it was unlikely that these twenty-eight mechanized corps could be fully-equipped before late 1943. Given these arbitrary changes in organization imposed by Stalin, the Red Army’s twenty-eight mechanized corps were only partly equipped and in a state of fatal disarray in June 1941. The deployment and employment of the Red Army’s mechanized forces was based on three strategic assumptions made by Stalin and his General Staff. First, Stalin believed that there would be adequate early warning prior to any German aggression, giving Red Army units time to prepare and deploy for combat. Due to this assumption, Red Army leaders felt that they could defer measures to enhance combat readiness in favor of other organizational priorities. The second Soviet strategic assumption was that with adequate logistics, training and preparation, the Red Army could hold its own against the Wehrmacht. Tied to this assumption was an implicit belief that enemy incursions could be limited to the buffer zones in Poland and Lithuania acquired in 1939-40. The third Soviet strategic assumption was that industrial mobilization was the key to victory and that campaigns would be decided by the side that had the greater ability to sustain its forces in protracted operations, not by fancy maneuvers. Due to Stalin’s ineptitude, the first Soviet strategic assumption was invalidated and undermined the validity of the second assumption as well. The cost of Stalin’s strategic miscalculations was the loss of the bulk of the pre-war Soviet tank force in the first three months of the campaign. However, the third Soviet strategic assumption proved entirely correct and eventually provided the means for the second assumption to regain saliency by the second year of the war. In short, despite certain blindness to impending war, Stalin and the Soviet General Staff did a far better job laying the groundwork for protracted operations than the Germans, and this strategic calculus would provide the Red Army’s tank forces with a valuable counterweight to the tactical skill of German panzer units. The Soviet numerical superiority in tanks for much of the War in the East – much bemoaned by German veterans – was not some sleight of hand trick, but the result of careful pre-war planning. Hitler deployed four panzer groups with a total of seventeen panzer divisions and 3,106 tanks for Operation Barbarossa, the invasion of the Soviet Union. In addition, two independent panzer battalions, Pz. Abt. 40 and Pz. Abt. 211, were deployed in Finland with 124 tanks (incl. twenty Pz. III). The 2 and 5. PanzerDivisionen were refitting in Germany after the Greek Campaign in April 1941 and were in OKH reserve. Otherwise, the only other extant panzer units were the 15. Panzer-Division with Generalleutnant Erwin Rommel in Libya and two panzer brigades in France. No other panzer units were in the process of forming in Germany. Consequently, the OKH was committing virtually all of the available German panzer forces to Barbarossa, with negligible reserves and limited monthly production output to replace losses. In mid-1941, German industry was producing an average of 250 tanks per month, half of which were the Pz. III medium tank. Combat experience in France and Belgium in 1940 indicated that the Germans could expect to lose about one-third of their medium tanks even in a short six-week campaign, which Hitler regarded as acceptable losses. Furthermore, German industry had no tanks beyond the Pz. III or Pz. IV in advance development. The Heereswaffenamt (Army Weapons Office) only authorized Henschel and Porsche to begin working on prototypes for a new heavy tank four weeks before Operation Barbarossa began, and this program had no special priority until after the first encounters with the Soviet T-34 and KV-1 tanks in combat. The primary operational objectives of the four German panzer groups were Leningrad in the north, Moscow in the center and Kiev and the Donbas region in the south. The distance from their starting positions to their operational objectives was 800km for Panzergruppe 4, 1,000km for Panzergruppe 2 and 3, and over 1,200km for Panzergruppe 1. Hitler expected these objectives to be reached within about ten weeks of the start of Barbarossa, an unprecedented rate of advance in modern military history. However, it was questionable whether German tanks could even move this far in this amount of time, even if much of the Red Army was destroyed on the border. As a general rule of thumb, about 5 per cent of tanks in a given unit will break down for mechanical reasons after a 100km road march, although most can be repaired within a few hours. Just three years before Barbarossa, nearly 30 per cent of the 2. Panzer-Division’s tanks broke down on the unopposed 670km road march to Vienna, along good roads. If the panzer divisions suffered a similar scale of combat losses as in the 1940 Western Campaign, no more than 10-20 per cent of the original panzers would be likely to reach their objectives. Operation Barbarossa’s bold scheme of maneuver was undermined by very poor intelligence preparation by German intelligence services. In actuality, the OKH intelligence staff had a faulty understanding of the strength and dispositions of the Red Army. German signals intelligence had not detected the reformation of Soviet mechanized corps in July 1940 and believed that the Red Army’s armour was still deployed as independent tank and mechanized brigades. In early June 1941, Oberst Eberhard Kinzel, head of the OKH’s Fremde Heere Ost (Foreign Armies East), assessed that the Red Army would deploy forty-one mechanized brigades with about 9,500 tanks against the Wehrmacht. Kinzel’s shop produced a handbook on Soviet tanks for the panzer groups, which described the various models of the T-26, T-28, T-35 and BT-5/7 in detail. The handbook also included information about a new Soviet heavy tank equipped with 60mm-thick armour and 76.2mm main armament that had been used against the Finns in December 1939; this was the SMK prototype, which the Germans erroneously labeled as the T-35C. Although Kinzel was clearly aware that the Soviets had fielded a prototype heavy tank eighteen months prior to Barbarossa, he assessed that existing German anti-tank weapons could defeat it. Prior to the German invasion, Stalin wanted to keep his strategic options open, to gain territory when possible, but to avoid being dragged into a fight before he felt the Red Army was ready. He wanted a sizeable portion of the newly-forming mechanized corps positioned near the western borders to deter German attack, but the rest would be deployed further back in reserve. In the event of invasion, the Red Army’s existing war plan directed that all available mechanized corps should be immediately committed to counterattack any German penetrations across the border. Unwittingly, this plan played into German hands, by forcing Soviet tank commanders to send unprepared units into battle piece-meal, directly into the face of on-coming German panzer schwerpunkt (main efforts). Indeed, the German panzer forces would be at their strongest in the border regions, where distance and logistics had not yet attenuated their combat power. However, the German planners in the OKH had no appreciation for the Soviet military philosophy of echeloned attack and defense, which meant that defeating the Red Army in a single campaign would prove far more difficult than the French Army in 1940. The entire essence of the so-called Blitzkrieg doctrine was in using concentrated armoured formations in short, powerful jabs to dislocate an enemy’s defense by isolating his best forces. A reasonable enemy was then expected to sue for peace due to the sudden setback. However, neither Stalin nor the Red Army had any incentive to be reasonable once it became clear that Hitler’s strategic objective was to exterminate them. By opting for a war of annihilation, Hitler made it impossible for the Wehrmacht to defeat the Red Army in a single campaign. Between September 1939 and May 1941, German panzer divisions had encountered no serious difficulties in their campaigns due to either adverse terrain or weather conditions (other than the English Channel, which was conveniently ignored). In particular, Panzergruppe Kleist had been able to quickly pass through the `impenetrable’ Ardennes Forrest and then conduct successful opposed river crossings across the rivers Meuse and Somme in France. In April 1941, Kleist’s panzers were able to overrun Yugoslavia and Greece in less than three weeks, despite numerous rivers and mountainous terrain. The overriding impression Hitler and the OKH leadership gained from the Wehrmacht’s preceding campaigns was that terrain in itself was not a serious obstacle to the panzers. Nor did Hitler and the OKH have any useful experience with mechanized operations under winter conditions. In contrast, the Red Army had learned painful lessons about the limitations of mechanized units in forested terrain and winter conditions during the 1939-40 Russo-Finnish War and were in the process of incorporating some of the lessons learned. Crossing rivers or large streams was an essential feature of military operations in the Soviet Union and the relative fording capabilities of tanks had a major impact on the tempo of armoured operations. Although both Germany and the Soviet Union had a small number of tanks with amphibious capabilities, such as the Pz. III and Pz. IV Tauchpanzer and the T-37, T-38 and T-40 light amphibious tanks, the majority of tanks on both sides could not ford water that was deeper than one meter (i. e. chest deep on a man). The bridging capabilities of the 1941-42 panzer divisions were rather rudimentary – a Bru” ckenkolonne B or K could construct a 50-meter long pontoon bridge in about twelve hours that could just support a Pz. III medium tank, but the Pz. IV and later Tiger and Panthers needed proper bridges to get across significant water obstacles. Indeed, the Wehrmacht lagged behind the Allies in assault bridging, having nothing like the British Bailey bridge. Soviet tank divisions of 1941 were supposed to have a pontoon bridge battalion, but most were never fully formed or quickly lost during the hectic retreats of 1941. While tanks could often cross smaller rivers at shallow fording sites, these critical locations were usually defended by anti-tank guns and mines. Larger rivers, such as the Dnieper or Volga, could not be crossed without substantial army-level engineer support. Pontoon rafts could be constructed to get small numbers of tanks across a large river, but this was usually only sufficient to defend a bridgehead against enemy counterattack. Thus, the capture of intact bridges – particularly railroad bridges, which could support the weight of tanks – was an important constant in Eastern Front armoured operations: both sides sought opportunities to seize poorly-defended bridges because they allowed tanks to do what they do best – move fast and use their shock effect to disrupt an enemy’s defenses. When bridges or fording sites were not available, armoured operations came to a full stop. Generally, you can try to go just about anywhere with a tank – at least once – but you may regret that you tried. Armoured operations on the Eastern Front were often impeded or channelized – forced into narrow mobility corridors – due to `no-go’ terrain such as marshes or dense forests. The marshlands between Leningrad and Ostashkov in northern Russia and the Pripet marshes were particularly hazardous for armoured operations. Tanks could easily become irretrievably bogged down in marshy terrain, or forced to move along narrow tracks that made them very vulnerable to anti-tank ambushes. In the early border battles in 1941, the Red Army foolishly lost a number of precious T-34 and KV-1 tanks in water-logged areas in the Pripet Marshes. The best tank country on the Eastern Front was the steppe country of the Ukraine, although this region also had the worst mud during the rainy periods. There were areas of `slow-go’ terrain in the Soviet Union, including urban areas and the ravines along the River Don, which could cause tanks to throw track. The Germans were particularly shocked by the almost total lack of decent all-weather roads in the Soviet Union, which increased the wear and tear on all vehicles and greatly reduced their mobility. The Germans had totally discounted the severity of the weather in the Soviet Union and were shocked in turn by the summer heat, the autumn mud and the harsh winter cold. Mud in particular is the bane of the existence of all tankers, but the idea that it only interfered with German mobile operations and that it was only a problem during the autumn and spring Rasputitsa season is an oversimplification that has been accepted for too long in Western historiography about the Eastern Front. First of all, the Eastern Front stretched over 1,700km from Leningrad to the Crimea and the weather could vary considerably across regions; a typical rain system would cover a 400-500km wide area, but other areas received no rain (or snow). Weather fronts moved from west to east across Russia, meaning that bad weather would generally hit the Germans first. Second, the summer months of June-July tended to have the most rain, but April and May were the driest months. In 1941, Heeresgruppe Süd had twice as much rain in July as it did in September-October, and mud caused significant mobility problems in the summer as well. When mud occurred, the wheeled vehicles in armoured units and towed artillery pieces were likely to be the most affected, but tracked vehicles could generally move until the mud became so deep that the tank either scraped bottom or the roadwheels became too fouled with mud. When the supply trucks couldn’t make it through the mud, armoured operations ground to a halt from lack of supplies and ammunition. Oftentimes, SPW half tracks had to be diverted from their primary combat tasks of transporting infantry to making supply runs through muddy areas or going to pull mired trucks out. Routine track maintenance became much more difficult when everything was caked in thick, gooey mud. Soviet tankers also complained about the mud and it significantly affected their operations as well. The main Soviet tanks in 1941 – the T-26 and BT-7 – had even narrower tracks and less engine power than the German Pz. III, meaning that most Red Army tank units in 1941 were more prone to being impeded by muddy roads. Since Soviet tank brigades in 1941-42 consisted of mixed vehicle types, the superior T-34s would still have to travel at the rate of the slower light tanks. The first snow arrived over the Eastern Front in October 1941, but in most areas it consisted of only 5cm and turned to rain within twenty-four hours. There were only two or three days with snow in October, with more falling in the humid Ukraine than around Leningrad. Snowfall in November jumped to about 20cm in central Russia, but the heaviest snowfalls did not occur until December- February. German equipment was designed to operate in temperate areas and proved unsuited to cold-weather operations in Russia. 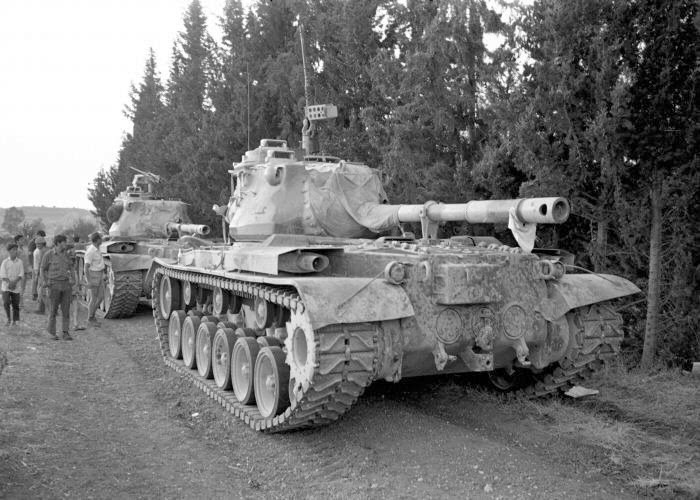 Panzer crews were particularly shocked to find that their tracks could literally freeze to the ground in winter months or their batteries crack when the fluid inside froze. The Czech-built Pz. 35(t) used a hydraulic system that literally froze in October 1941, bringing that vehicle’s career to an abrupt end. When the German expectations of a short campaign were unfulfilled, the panzers were forced to conduct operations under all weather conditions, for which they were not psychologically or materially equipped. During the interwar period, there were two contending schools of thought among major armies in regard to the proper employment of tanks. The dominant school was that tanks were best suited for the infantry support role and should be attached directly to infantry units. More revolutionary was the concept of armoured units that could operate independently, which was inspired in part by the theories of the British armour theorist, J. F. C. Fuller, and his Plan 1919. Fuller’s theories of mechanization, expounded in his interwar writings, attracted followers in both the Reichswehr and the Red Army. The proponents of creating independent armour units argued for looking beyond the breakthrough battle and for using tanks in a long-distance, exploitation role. However, this kind of radical thinking ran head-on into the powerful cavalry lobbies in both Germany and the Soviet Union, who regarded tanks as a threat to the mounted branch’s traditional use in the exploitation role. Both infantry and cavalry officers generally opposed the creation of independent tank units or tried to place limits on the kind of role they would serve. The infantry school argued for the development of infantry support tanks with a high level of armoured protection and had a howitzer-type weapon, but speed or range were not important requirements. Cavalry officers gradually accepted that tanks would be included in their country’s armed forces, but preferred light, fast tanks that could assist the cavalry in reconnaissance and pursuit roles. These intra-service debates about tank design crossed national lines and shaped tank development in Britain, the United States, France, Germany and the Soviet Union in the 1920s and 1930s. Armour theorists gradually recognized that in order to develop effective tanks, both the infantry support and cavalry exploitation missions needed to be reconciled in technical requirements. The utopian idea of a single `universal tank’ that could successfully accomplish all missions was quickly determined to be unfeasible and theorists recognized that more than one type of tank would be necessary in order to fulfill armour’s potential on the battlefield. The infantry support mission required a tank that was equipped with weapons capable of engaging enemy infantry entrenched in fieldworks, bunkers or buildings. Given the high threat level from enemy artillery and anti-tank weapons, it would also be prudent for infantry support tanks to possess a high level of armoured protection. However, the exploitation mission suggested a tank with the primary requirements of speed and mobility. Most armies struggled with developing the right types of tanks, with the best characteristics and in the best mix to meet these mission requirements. Both the Red Army and the Reichswehr made choices about what tanks they wanted, based upon doctrinal and technological influences in the 1930s, which would shape battlefield outcomes in 1941-45. Since Germany was not allowed to build or possess tanks due to the restrictions of the Treaty of Versailles after the First World War, the postwar Reichswehr made covert agreements with the Red Army to establish a tank training school at Kazan in 1929. The Red Army, which only had a handful of obsolete tanks left over from the First World War, was desperate to acquire foreign tank technology and willingly cooperated with the Reichswehr. During the four years that the Kazan school was operational, the Germans tested two different tank prototypes there and determined the necessity of mounting radios in every tank in order to exercise effective command and control over an armoured unit (the importance of this was further reinforced when German observers noted the successful use of radios in British pre-war tank exercises). German officers such as Erich von Manstein, Walter Model and Walter Nehring spent time in the Soviet Union and observed Soviet tank exercises, although this apparently did little to enhance their regard for the professionalism of Soviet tankers. 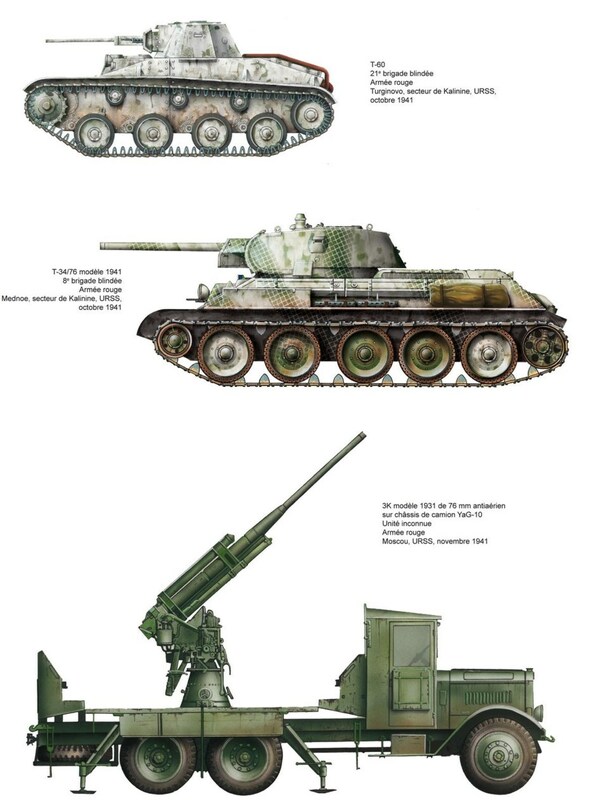 As part of the deal for hosting the Kazan school, the Red Army acquired several 3.7cm Pak guns and the design for a 7.5cm anti-aircraft gun from the German firm Rheinmetall, which were used to bolster Soviet research on tank armament. The Soviets also acquired fuel-injection technology from Germany, which was used to enhance Konstantin F. Chelpan’s development of an experimental diesel tank engine at the Kharkov Locomotive Works. However, the Soviet leadership believed that the Germans were not sharing their best technology and finally closed the school in September 1933. Soviet military theorists such as Mikhail Tukhachevsky, Vladimir K. Triandafillov and Georgy Isserson had been assiduously working on a new military doctrine since the late 1920s. This doctrine, known as Deep Battle (glubokiy boy), was partly inspired by J. F. C. Fuller’s Plan 1919 and mixed it with Marxist-Leninist thinking about protracted warfare. Early on, the Red Army leadership recognized the imperative need to develop a tank force, but was reluctant to choose between the infantry support and cavalry schools. Instead, the Red Army codified its basic tank doctrine in Field Regulations PU-29, issued in October 1929. These regulations specified that PP tanks would provide infantry support, while DD tanks would push deeper into enemy rear areas to destroy their artillery. The Red Army cavalry lobby, in the form of Marshall Semyon Budyonny, also managed to retain enough influence that PU-29 was written to include joint tank-cavalry Deep Operations (glubokaya operatsiya). At the same time, the Red Army established the Office of Mechanization and Motorization (UMM) to develop the tanks necessary to fulfill the doctrine spelled out in PU-29, as well as train and organize all mechanized forces. The first head of the UMM, Innocent A. Khalepsky, decided that the Red Army also needed a heavy breakthrough tank to penetrate fortified areas, so he recommended a 60-ton tank with two 76.2mm howitzers and a 37mm cannon. From this point on, Red Army doctrine pushed Soviet industry to concurrently develop light, medium and heavy tanks. At the start of the First Five Year Plan (1928-32), Soviet industry was unable to build indigenously-designed tank engines or tank guns and barely able to construct a few dozen light tankettes per year. Since Stalin and the Politburo were more concerned about falling behind Western tank developments than domestic economic consequences, they arbitrarily doubled the number of tanks required by the Red Army and rushed technical development in order to field the largest number of tanks possible. 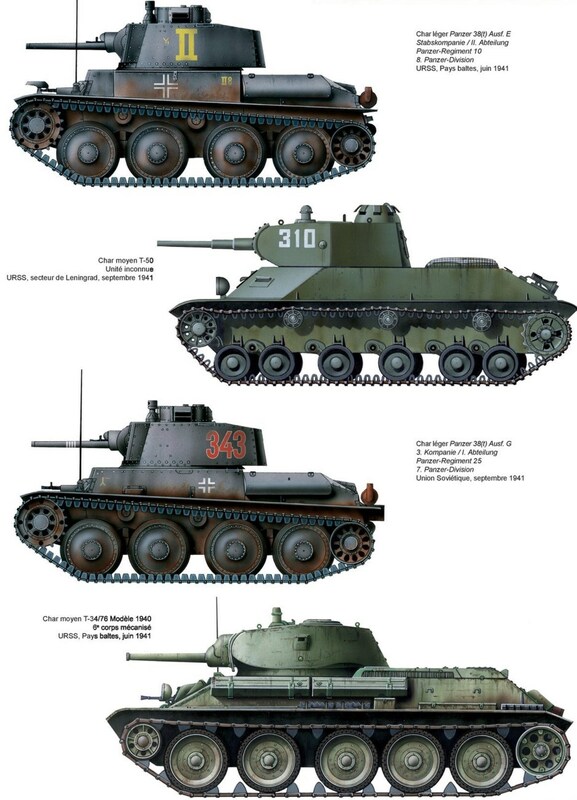 Three tank design bureaux were established under the plan: OKMO and SKB-2 in Leningrad and KhPZ at Kharkov. An artillery design bureau in Gorky was also tasked with developing new tank armament. At Stalin’s behest, the UMM authorized numerous tank projects, many of which proved failures, but this also jump-started the Soviet tank industry. Between the pressure of fulfilling quotas established by the Five Year Plans and the personal consequences of `obstructionism,’ the Soviet tank design bureaux were forced to develop tanks that could be built quickly and in numbers, which would prove to be advantageous in a long war. Through ruthless effort, Stalin’s regime was able to build up the Soviet Union’s defense industrial base at an astonishing rate and succeeded in producing over 5,000 light tanks under the First Five Year Plan. 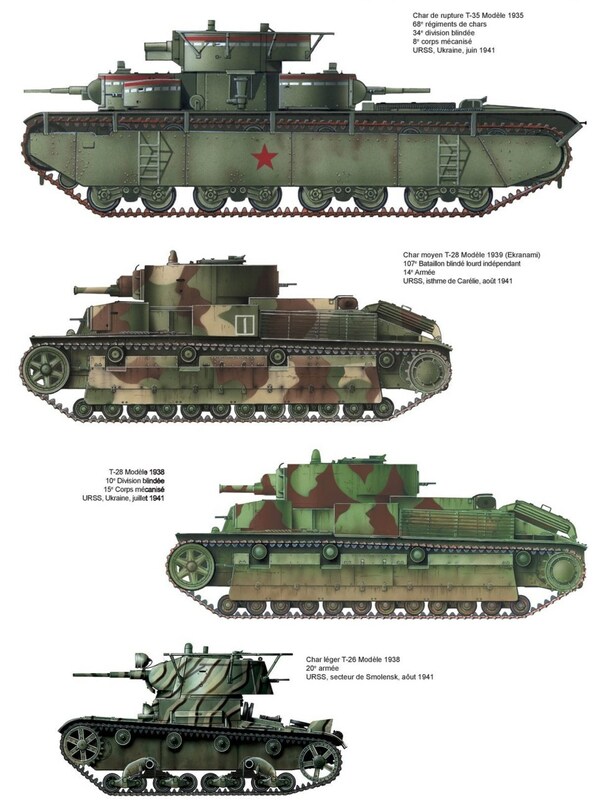 A generation of young Soviet engineers proved adept at using off-the-shelf components and designs acquired legally and illegally from Britain and the United States, while Soviet engineers took the idea of sloped armour from John Walter Christie’s innovative M1931 tank prototype and employed it on the BT-series light tanks. Soviet espionage was also successful in acquiring tank design information in Britain. Despite negligible experience in armoured vehicle design and fabrication, Soviet engineers were able to move from the prototype stage to series production of the T-26 and BT-series light tanks within less than two years. 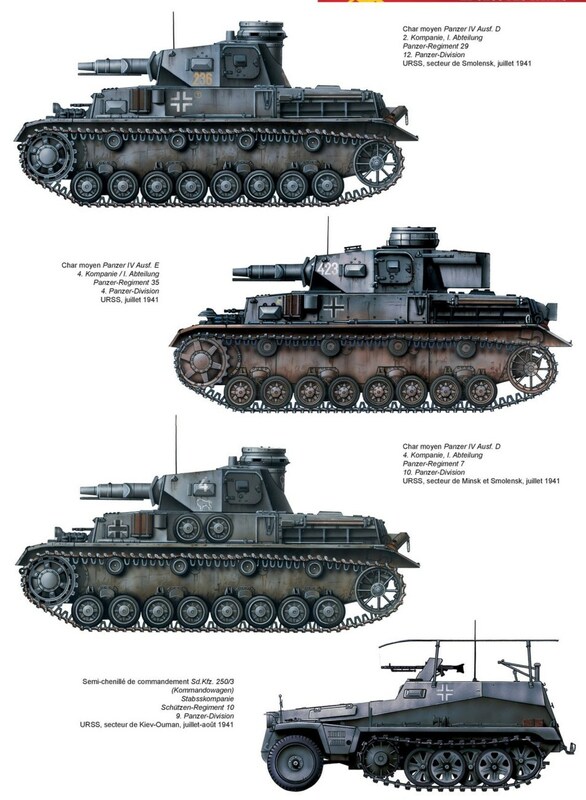 Although Soviet engineers were forced to use foreign-designed engine components and armament in their first generation of indigenous tanks, the design bureaux in Leningrad, Kharkov and Gorky were also given some of the best engineering talent in the Soviet Union, who were tasked with developing indigenous engines and cannon for the next generation of tanks. In particular, the talented Konstantin F. Chelpan made excellent progress – with the backing of Khalepsky, the head of UMM – in developing a practical diesel tank engine, which would have enormous implications for armoured warfare on the Eastern Front in the Second World War. Due to the success of the First Five Year Plan, the Red Army had sufficient tanks by 1932 that it could afford to create both an independent tank force and separate tank brigades for direct infantry support. Two mechanized corps were formed – three years before the Germans fielded their first panzer divisions. The mechanized corps were intended for independent Deep Operations, up to 250km in three days. While the T-26 was intended to fulfill the NPP role, the BT-series fast tank (Bystrokhodny tank) was built for speed and mobility for the DD exploitation role. The Red Army formed separate heavy tank brigades with the new T-35 heavy tank and independent mechanized brigades to support the infantry and cavalry. During 1932-33, the Red Army began testing the Deep Battle concept in field maneuvers with the new tank units. When the Red Army had difficulty in actually conducting field exercises according to Deep Battle doctrine, the innovative Aleksandr I. Sediakin, deputy chief of the general staff, was put in charge of combat training and transforming the new doctrine into a practical reality. By 1934, Sediakin had developed a Deep Battle `playbook’ for Soviet commanders that instructed them how best to employ a combined arms attack using armour, mechanized infantry, artillery and airpower. Sediakin and his staff intensively studied and tested Deep Battle doctrine, using the mechanized corps as test beds, and one of his crucial findings was the logistical difficulties of getting fuel to tank units that achieved a deep penetration. The Military Academy of Mechanization and Motorization (VAMM) in Moscow also worked to train battalion and regimental-level armour leaders in the new doctrine. In 1936, Deep Battle became the official doctrine of the Red Army in Field Regulations PU-36. It is important to note, however, that Sediakin’s `playbook’ approach to Deep Battle was in line with the Marxist preference for prescriptive training, which encouraged junior leaders to follow a checklist by rote, rather than employ initiative on the battlefield. Globally, one of the most important patterns that scholars highlight in the early modern era is the gradual unfolding of the “Military Revolution” in Europe-a profound military, political and socioeconomic transformation between the sixteenth and eighteenth centuries. Such an approach usually focuses on the European expansion around the world, in particular the Spanish conquests of the Aztec and Inca states and the arrival and establishment of European navies in the Indian Ocean, where local Islamic and Indian states proved to be unable to retain supremacy of the seas. Equally interesting, however, is the increasing ability of Europe to fight off the Ottoman attacks, clearly revealed when comparing the Christian failures of the early sixteenth century with successes of the seventeenth century. The European conquests-of Cortes and Nuno de Guzman, in central Mexico, Pizzaro in Peru, Francisco and Pedro de Alvarado Orozco in Guatemala, or Francisco de Montejo in the Yucatan Peninsula to name just a few-consequently followed the pre-Columbian trade routes which greatly contributed to their success. From the earliest years of Spanish colonization of the western hemisphere, the Spaniards became aware of how quickly they could seize control over local population by capturing local leaders. This tactic may have had precedents in Spanish experiences with the Moors or in North Africa, but the surprise capture of the local ruler during a seemingly friendly negotiation became a standard. Thus, in 1519, Cortés, invited to an audience with the Aztec emperor Moctezuma II, captured the emperor in an attempt to seize control of the empire. His success inspired Francisco Pizzaro to capture the Inca leader Atahualpa in 1531. Despite the popular perception of the Spanish conquistadors as invincible and gallant warriors, the real story of success lies in local elites’ early support for foreign invasions. Their motivation included both the desire to free themselves from existing military and tributary controls as well as the opportunity to aggrandize themselves with land and riches. Indeed, alliance-building was a fundamental practice in Mesoamerica, successfully used by the Aztecs in the form of the Triple Alliance (confederation of city-states of Tenochtitlan, Texcoco, and Tlacopan) to incorporate much of the region into their empire prior to Europeans’ arrival. When Cortés arrived in Mesoamerica in 1519, the Fat Cacique of Cempoala followed a long-standing alliance-building tradition in offering the Spaniard an alliance with Tlaxcala, Huexotzingo, and other city-states against the powerful Aztecs; the presence of tens of thousands of native soldiers allowed the Spaniards to bring down the Aztec empire. 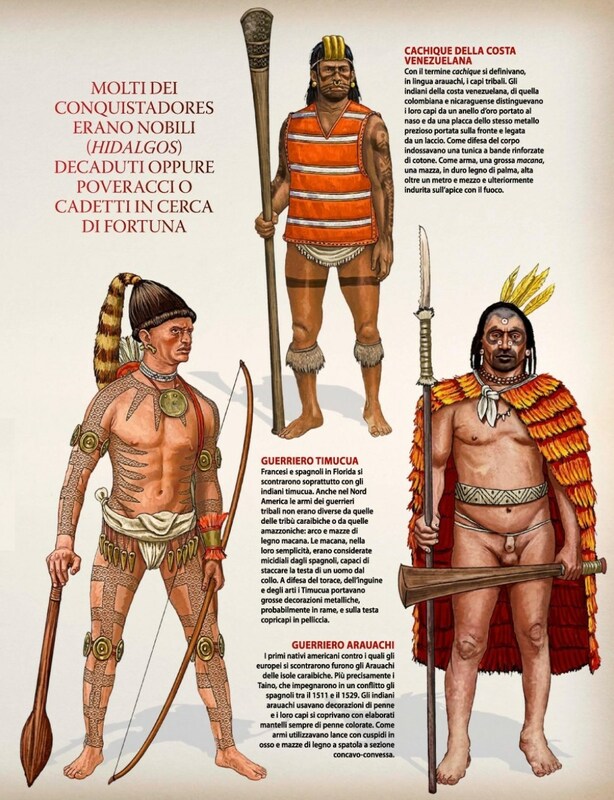 The Indians of pre-Hispanic Mexico developed strategic war aims, battlefield tactics, and arms and armaments to suit the societies they created. Aztec warfare, as well as that of other neighboring polities and cultures, primarily aimed to capture but not kill opposing warriors, who would then be sacrificed to various deities. Whereas Eurasian armies developed well-organized and highly maneuverable infantry and cavalry formations, the Aztecs and their neighbors, as well as all of their predecessors, lacked close-ordered drill and instead stressed charges and individual combat designed to win prestige by acquiring sacrificial victims. They still, however, also fought for larger objectives, namely conquest and subjugation, as representations of stylized burning temples and tribute lists in the few extant Mexica codices (bound books) make abundantly clear. 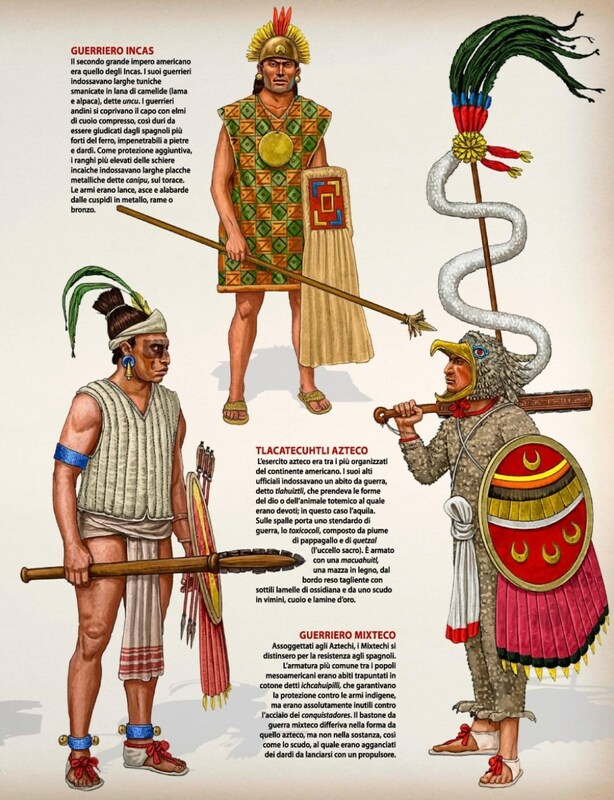 The Aztec (or Triple Alliance) order of battle illustrates the height of pre-Hispanic arms and armaments in Mesoamerica. The Aztecs fielded armies as large as 100,000 to 200,000 fighting men, divided into 8,000-man units. Lightly armed scouts and skirmishers, carrying atlatl launchers and spears, preceded the more heavily armed main body of warriors. These warriors wore quilted cotton armor; carried painted, sometimes feathered, round shields; and employed razor-sharp obsidian-bladed clubs and knives as well as slings, darts, and other weapons to make war. The highest-ranked among them, including commanders and members of prestigious military orders, such as the Otomi who were named after an especially fierce tribe of neighboring Indians, and at times the emperor himself wore elaborate feathered costumes and sandals. The more elite the military order, the more elaborate the feathered costume. Reserve forces, including conscripted troops from conquered provinces, followed. Such formations failed to survive Spanish battlefield tactics and arms and armaments during the conquest of Mexico. 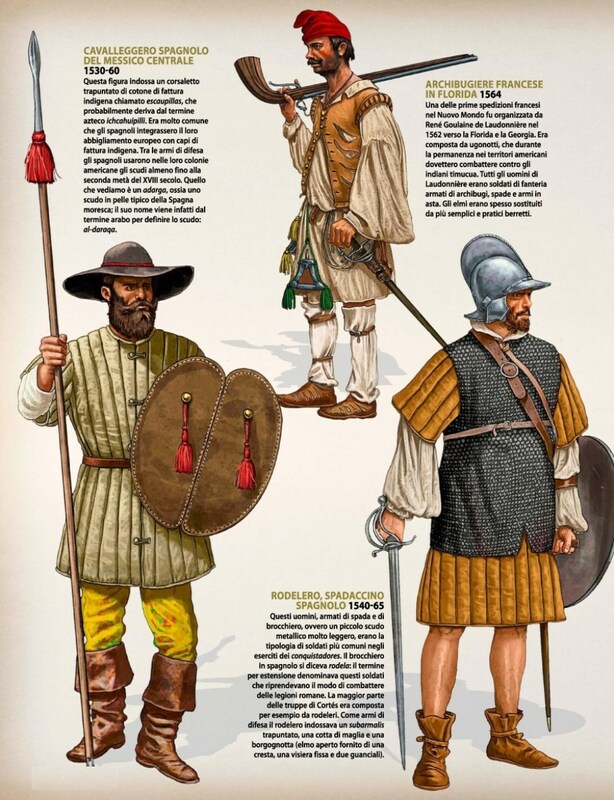 While the Aztecs obsidian-bladed club could and did decapitate horses, it proved too unwieldy and could not match the Spaniards’ steel swords, which could parry, slash, and thrust, not to mention the Spaniards’ determination to destroy and not merely capture their opponents in war. Bibliography Hassig, Ross. Aztec Warfare: Imperial Expansion and Political Control. Norman: University of Oklahoma Press, 1995. Padden, R. C. The Hummingbird and the Hawk: Conquest and Sovereignty in the Valley of Mexico, 1503-1541. New York: Harper and Row, 1970. The United States played a prominent role in the United Nations in separating the combatants and ending the hostilities in 1956. As we noted in the previous chapter, this was hardly because the American administration was sympathetic to Nasser’s plight or to Arab nationalism. The Americans felt deeply embarrassed and compromised by their allies, Britain and France, who had acted without consulting them—and right on the eve of a presidential election at that. The American public expressed concern about upholding the principles of the UN Charter, and President Eisenhower displayed a sense of moral outrage that they had been violated. Although this stand scored points in the short run, subsequent U.S. actions tended to erode Arab goodwill. American refusal to supply medical help for the victims of allied bombing at Port Said, and the cessation of the CARE program in Egypt, which had provided free lunches to Egyptian schoolchildren, spoke louder than pious platitudes. Indeed, the United States adhered initially to a Western economic boycott of Egypt, refusing to sell surplus wheat and oil. In this way, the United States exhibited its continued friendship for its European allies and its disdain for Nasser. At the same time, this attitude enabled and encouraged the Soviet Union and its satellites to extend their influence. Economic and technical assistance on an increasingly large scale were evident after 1957, capped in Egypt by the Soviet agreement in October 1958 to help build the Aswan High Dam. The worth of Soviet arms to Egypt would eventually total about $2 billion. This compared to American economic and technical aid to Israel of about $850 million between 1949 and 1965. Because Britain and France had been so completely discredited in the region, however, the United States found itself in the position of defending Western interests and resisting the expansion of Soviet influence in those countries that had not followed Nasser’s lead. The new instrument of American policy became the Eisenhower Doctrine, approved by Congress in March 1957. By its terms, the president was authorized to extend economic and military assistance, including troops, to any Middle Eastern nation that requested it against the threat of international communism. No Arab country, with the exception of Libya and Lebanon, was eager to embrace the doctrine. Zionism, not communism, was considered the enemy. Moreover, the United States was seen as attempting to weaken Arab unity by insisting that the Arab countries line up on one side or the other in the Cold War. Although the United States continued to maintain an important airbase at Dhahran (until 1961), and the Saudis were considered to be “allies,” the Saudi king did not endorse the Eisenhower Doctrine. Nor did King Hussein, even though the United States extended $10 million in financial assistance to Jordan when the king quashed a Nasser-supported Communist plot against the monarchy in 1957. The one Arab country enthusiastic about the Eisenhower Doctrine was Lebanon, especially under its Christian president, Camille Chamoun. Chamoun despised Nasser and was disturbed about growing Egyptian and Soviet influence, especially in neighboring Syria. Closer adherence to the West through formal adherence to the Eisenhower Doctrine, however, seemed to violate the spirit of Lebanon’s “national pact,” through which a balance of interests had been maintained among Lebanon’s many religious and family groups. Moreover, Chamoun’s overt identification with Western interests alienated other Lebanese political leaders and a large part of the Muslim population whose sympathies were with Nasser and Arab nationalism. Chamoun attempted to secure a second term as president in violation of the constitution. 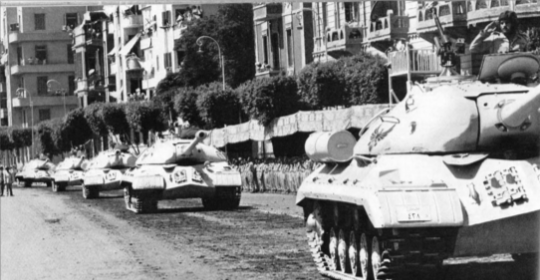 Anti-Chamoun and pro-Nasserist groups in Lebanon, supplied with funds, weapons, and propaganda from the newly formed United Arab Republic, saw this as an opportunity to gain power, and this set off a brief civil war in 1958. At the same time, in July 1958, in Iraq the pro-Western monarchy was overthrown. Fearing that a Communist takeover in the region was imminent, and worried about his own safety, Chamoun asked for American help. Largely because of the situation in Iraq, Eisenhower responded promptly. American troops landed on the beaches of Lebanon, as British troops rushed to the aid of King Hussein to stabilize his regime. Chamoun, who had helped precipitate the crisis by hinting that he would not give up the presidency, wisely left office in September at the end of his term. A more neutral government was formed in Lebanon, and the U.S. Marines departed, indicating, among other things, that the United States would not directly interfere with the Lebanese political process. The new Lebanese government repudiated the Eisenhower Doctrine, which left the next American administration with the task of reevaluating U.S. foreign policy in the region. In Washington, the Arab–Israeli conflict continued to be placed within the context of basic American interests in the area. These included uninterrupted communication facilities and access to oil, the maintenance of general stability, and the protection of strategic interests against the threat of Soviet expansionism. In the Kennedy administration, however, a new approach to the Arab–Israeli conflict evolved, which John Badeau, Kennedy’s ambassador to Egypt, later called the “icebox” device: deal with those issues on which Middle Easterners and Americans can agree, and put the others in cold storage for the time being. One such issue was the Palestinian refugee problem, which the United States unsuccessfully took a stab at in the fall of 1961. Kennedy sent Dr. Joseph Johnson, president of the Carnegie Foundation, to consult the Israelis and Arabs about ways to deal with the situation. Johnson’s own plan was to offer the refugees, under the active supervision of the United Nations, the choice of return or compensation for settlement outside Israel. Johnson had no luck on his first or on a subsequent trip the next spring in moving the different parties from their respective positions. The Arabs continued to insist on the right of return of all refugees, the Israelis on recognition and direct negotiation of all outstanding issues, including that of the refugees. The United States assured Israel that it upheld the principle of the territorial integrity of all countries in the region and would defend the Jewish state against aggression. There seemed during the Kennedy years, however, a somewhat greater appreciation of the dynamics and complexities of the Arab world. American policymakers began to realize that the achievement of American objectives did not require a specific form of political or economic system. Indeed, many believed that America could aid constructive change in Middle Eastern countries through nonmilitary aid and cultural exchange, to the mutual benefit of the Arabs and the United States. Economic and technical aid was therefore offered to Egypt, especially through Public Law 480, which enabled recipient countries to purchase surplus wheat and other commodities with local currency that remained in the country to generate development projects. In the early 1960s, for example, the United States supplied about $150 million a year in wheat surpluses, which was more than half the grain consumed in Egypt. Meanwhile, quantities of Soviet arms were pouring into Egypt, Syria, and Iraq. Israel used Nasser’s involvement in the Yemen civil war, as well as his hiring of German technicians to help develop surface-to-surface missiles and jet fighters, as arguments to persuade the United States to sell Israel weapons directly for the first time. The Kennedy administration agreed to sell Israel Hawk ground-to-air missiles and tanks at the end of September 1962, and shipments of American arms went to Saudi Arabia and Jordan. In this way, the United States attempted to maintain a balance between Israel and the Arabs, and between the “radical” Arab countries supplied by the Soviet Union and those supplied by the United States. The administration of Lyndon Johnson continued the basic approach of an arms balance and upholding the territorial integrity of all Middle Eastern countries including Israel, but with a different style and far less consistency. The different style arose to some extent because of personal antipathy between Nasser and Johnson. Nasser took an almost instant dislike to the American president and mentioned in his letters how he was put off by photographs of Johnson showing reporters the scar from his recent gallbladder operation and with his feet up on his desk. Nasser also feared that the United States might move to oust him, as it had Mossadeq in Iran and Ngo Dinh Diem in South Vietnam. He suspected, too, that the United States had been involved in removing such leaders as Ahmed Ben Bella, Ahmed Sukarno, and Kwame Nkrumah. Johnson himself was not attuned to the sensibilities of foreign leaders, and he had little patience with Nasser. The conduct of American foreign relations in the Middle East was further complicated after 1964 by difficulties on the domestic scene and by the escalating war in Vietnam. When the United States expressed its displeasure over Nasser’s aid to rebels in the Belgian Congo, Nasser told the United States at the end of 1964 to forget its aid and go drink seawater. With less surplus wheat available to dispose of anyway, American economic aid to Egypt was discontinued shortly thereafter, causing severe repercussions in the Egyptian economy. This seemed to end any hope of a rapprochement between the two countries and to signal that Egypt would not break out of the Soviet orbit. The Soviet Union greatly enhanced its role in the Middle East in the 1960s. Still, the United States believed that, by maintaining Israel’s military strength and aiding friendly Arab countries like Jordan and Saudi Arabia, its basic goals—maintaining stability in the region and thus diminishing the prospect of an Arab–Israeli war that could lead to superpower confrontation—had been preserved. Like the United States, the Soviet Union had its successes and failures in the Middle East. While the Soviet leaders would like to have seen the victory of communism in the area and were constantly reminded by the Chinese not to forget ideological imperatives, Soviet policy was of necessity based on realpolitik. Soviet goals included outflanking NATO, neutralizing the United States in the Middle East, and working to achieve preeminence in an area the Russians considered as almost their own backyard. After loosening their ties with socialist Israel in the 1950s and unequivocally adopting the Arab and Palestinian causes, the Soviets imitated the West in extending economic and military aid to their allies in the region. Under Nikita Khrushchev, between 1955 and 1959, the Soviets established a diplomatic presence in the area, made extensive arms deals, trained local armies, offered economic and technical assistance, and energetically supported anti-Western regimes. The Soviet leap over the so-called northern tier, however, had brought it right into the tangled web of inter-Arab affairs and created unavoidable dilemmas, similar to those experienced by the United States. As America had discovered, the Soviet Union found it difficult to have its cake and eat it too. The events surrounding the Iraqi coup in 1958, when Abdul Karim Qasim came to power supported by local Communists, illustrated the problem. Moscow was delighted by the revolution in Iraq but alienated Nasser by its support of Qasim, who had very different ideas about Arab unity and who in fact put down a pro-Nasser movement in Iraq. (This climate had, of course, made it easier for the United States to effect its own rapprochement with Nasser in the late 1950s and early 1960s.) Within two years, however, Qasim had also rejected local Communist support and refused recognition to the Iraq Communist party. This was a bitter disappointment to the Soviets. Nevertheless, the Soviet Union continued economic and especially military aid to regimes that were anti-West, at a high cost to its own economy. Thus, the Russians pledged support to Egypt to help build the second stage of the Aswan High Dam at the same time that the United States was providing Egypt with the bulk of its grain; and the arms flow to Egypt, Syria, and Iraq continued, albeit with a temporary halt in Iraq when Qasim was toppled by a Baath coup in 1963 that purged local Communists. In the meantime, the stakes had also been raised. It was one thing to embarrass the West, but another to challenge it. The Soviets began to realize the danger of local outbreaks that could eventually spark a wider conflagration. Moreover, the Russians found themselves in the position of sometimes seeing arms they had supplied being used in ways over which they had little control or which involved their own warring clients (Nasser versus competitive regimes in Baghdad or Damascus, Baghdad versus the Kurds, etc.). In particular, the Soviet Union was ambivalent about Nasser, applauding and supporting his actions when they hurt the West but being less sanguine when they threatened other Soviet clients. In the mid-1960s, the Soviets themselves decided that their ultimate ideological objectives might be reached by a continuation of aid and a policy of encouraging local Communists to work with the various governments in return for being left alone. This approach may or may not have encouraged the radicalization of the regimes in Egypt, Syria, and Iraq. However, as it became more apparent that circumstances for the achievement of both ideological and Cold War objectives were increasingly favorable, particularly in Syria after 1966, the Russians found themselves in the position of wanting and needing to preserve and extend their gains. The closer involvement in Middle East affairs, however, brought them right into the arena of the Arab–Israeli conflict, a fact illustrated dramatically in the events that precipitated the Six-Day War. In 1958, Gamal Abdul Nasser was the leading figure in the Arab world. By 1961, however, Syria had seceded from the UAR, and Qasim’s regime in Iraq was forging its own destiny, which would continue to diverge from that of Egypt with successive military coups. Internally, as noted above, Egypt’s economy was in poor shape. Moreover, Nasser’s friends from the Bandung conference and in the third world, leaders like Nehru, Sukarno, Ben Bella, and others, were no longer in power. Nasser had determined after 1956 that he would not become involved in a major confrontation with Israel unless he could win; that is, unless he was fully prepared militarily and the international circumstances were right. He recognized Israel’s growing economic and military strength and the international support Israel enjoyed in the West and among many of the developing nations. Because of Arab unpreparedness and Israel’s policy of retaliation, Nasser did not lend support for Syrian efforts to halt Israel’s water-diversion scheme. Nor did he react, despite Jordanian taunts, to Israel’s attack against as-Samu, except to insist to King Hussein that responsibility for repulsing Israel reprisal raids rested with the individual countries. Nasser retreated to this position again in April 1967, when, after several months of violent incidents in the north, an air battle erupted between Israel and Syria in which Israel violated Syrian airspace, shot down six MiGs, and buzzed Damascus. Nasser remained aloof. To the Russians, however, it seemed absolutely crucial to prod the Egyptians into living up to the commitment implied in the joint defense pact. The unstable Jadid regime in Syria had raised the stakes in the north without much apparent success and had embarked on a course that promised the counterproductive effect of massive Israeli retaliation. The achievement of Soviet objectives in Syria seemed to be in jeopardy. Only by the device of Nasser restraining Jadid and/or causing Israel to pause before retaliating for Syrian raids, because of the possibility of Egyptian action in the south, could some Soviet control be exerted over this situation. 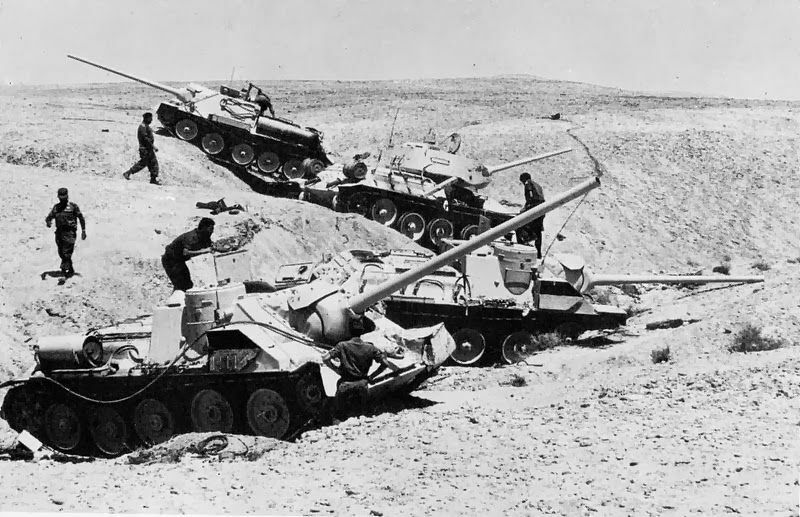 In early May 1967, therefore, the Russians passed on to the Egyptians information about heavy Israeli troop concentrations on the Syrian border and an Israeli contingency plan for an attack on Syria. The Soviets, and probably Nasser himself, knew that information about massive Israeli troop concentrations was false. Indeed, the UN Truce Supervision Organization (UNTSO), U.S. intelligence, and Egyptian observers on the spot failed to detect any Israeli moves. Nasser, however, decided to become involved and to take some action for several reasons. He was convinced that the United States was trying to get at him indirectly by urging Israel to hit Syria, but he believed the Russians would now stand behind him whatever action he took. Nasser had a false estimation of Egyptian strength based on the great amount of military hardware he had amassed. His poor economic situation called for some outlet for the frustration that had been building among the Egyptian people. And he certainly hoped that assuming an active role against Israel would quiet his critics and restore his position of leadership in the Arab world. Thus, on May 14, 1967, Cairo announced that Egyptian armed forces were in a state of maximum alert, and combat units crossed the Suez into Sinai. On May 16, Egypt requested the UNEF to be concentrated in the Gaza Strip; and on May 18, the Egyptian foreign minister demanded that UN Secretary General U Thant recall all troops of the UNEF stationed in the Gaza Strip and on UAR soil. This was a step Nasser had every legal right to take, but instead of procrastinating in order to defuse the growing crisis, U Thant complied almost immediately. Egyptian troops and tanks began to rumble across the Sinai and to take over UN positions. Syria also began to mobilize, as did Jordan and Iraq. On May 22, with Egyptian troops at Sharm al-Sheikh, Nasser announced the closing of the Strait of Tiran and thus the Gulf of Aqaba to Israeli vessels or any vessels carrying goods to Israel. Prime Minister Levi Eshkol replied the next day that Israel would consider any interference with freedom of shipping as an act of aggression against Israel. Bellicose speeches continued to emanate from Cairo, however, and during the next week, Nasser on several occasions stated that Palestine must be liberated and Israel destroyed. As the crisis escalated, the Security Council met in emergency session, but its discussions were fruitless and hampered by the Soviet veto. Israeli foreign minister Abba Eban flew to Paris, London, and the United States, as the Western countries groped for some way to defuse the situation. Although President Johnson publicly denounced Nasser’s closing of the waterway and promised that the United States would try to get other maritime nations to join in testing the blockade, the American Aide Memoire of 1957 was obviously a worthless scrap of paper. Privately, Johnson warned Israel against a preemptive strike, and Israeli moderates hesitated to act unilaterally. Nasser appeared to have Israel in a bind; the prolonged general mobilization in Israel was beginning to have a dire psychological as well as economic effect. To the Arabs, what had perhaps started as some limited action began to take on the possibility of a potentially successful military operation, as Nasser, believing he had the support of the Russians, went to the brink. On May 30, 1967, King Hussein of Jordan flew to Egypt to sign a defense pact with Egypt. He agreed to allow Iraqi troops to enter Jordanian territory in the event of hostilities and to place his troops under Egyptian military authority. PLO leader Shuqayri, although no friend of Hussein, was present at the signing ceremony and flew back to Jordan with the king. The situation was extremely difficult for Israel. 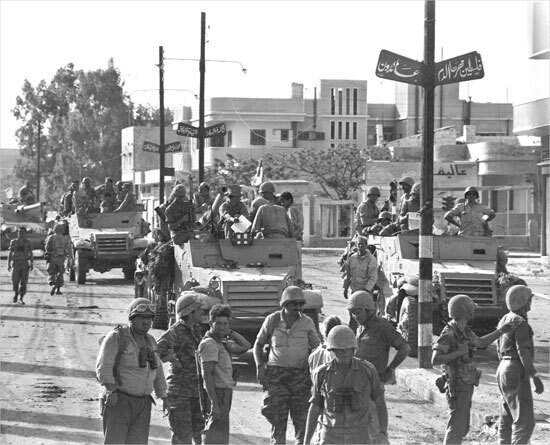 There were Arab armies poised on all its borders; mobilization was taking a toll economically, as normal life came to a standstill, and politically, there was a crisis situation, as Eshkol’s government seemed incapable of making a decision about what course of action to take. All armies have contingency plans, and as early as 1964 Israel had worked out such a plan for an attack against Egypt if necessary. Israel had on several occasions threatened reprisals against Syria and undoubtedly had various alternatives on the drawing board. Given Israel’s borders, the idea of the preemptive strike (or what some Israeli military leaders like Yigal Allon called the “preemptive counterstrike”) had come to be accepted, since Israel within its present borders was not in a position to absorb a first blow and survive. Because of Israel’s policies of massive retaliation and offensive warfare as the best defense, some historians and writers see all the Arab–Israeli wars as the result of Israeli aggressiveness and expansionism, which they attribute to an inherent dynamic and master plan of Zionism. In their view, while Nasser may have shown antipathy to Israel, and with good reason, he was not a warmonger—in contrast to Ben-Gurion and a coterie of younger Israeli “hawks” who had been planning another strike against Nasser for a decade. Other historians argue that despite the existence of military contingency plans, there is no evidence that Israel would have launched a full-scale war against Egypt had Nasser not taken the provocative actions he did. They contend, on the contrary, that the failure of Israel to retaliate for the closing of the Gulf of Aqaba—a retaliation that was expected among both the Arabs and the superpowers—and the hesitation and indecisiveness evident in Israel as diplomatic solutions were floated fed Nasser’s megalomania and encouraged King Hussein of Jordan to put aside past differences and climb on the bandwagon. They maintain that no matter how pragmatic Nasser could be, the defeat of 1948 and the drubbing of 1956 had only nourished Arab hatred of Israel and the desire for revenge. In any event, the Egyptian–Jordanian defense pact seems to have galvanized the Israelis, who put together a government of national unity (which included Menachem Begin, the leader of the opposition for all the years since statehood), in which Moshe Dayan was named minister of defense. With Dayan in the cabinet, and with the Israeli belief that the existence of the entire nation was indeed in jeopardy, it was almost a certainty that Israel would strike the first blow. According to apologists for Israel, this is precisely what Nasser wanted. Were he to initiate hostilities, the issue would not be about shipping in the Gulf of Aqaba but about the continued existence of the Jewish state, which the United States was pledged to uphold. In this view, Nasser believed that Israel, in striking a first blow, would be diplomatically isolated, especially from the United States, and that the Americans would hesitate to intervene on Israel’s side. Wiser leaders than Eshkol and Nasser, however, might have averted conflict. The Six-Day War broke out on the morning of June 5, 1967, as Israeli planes destroyed most of Egypt’s air force on the ground. Details of the war itself have been told in countless books and will not be repeated here, but the importance of air power and the cohesiveness of Israel’s citizen army should be mentioned as significant factors in Israel’s success. The outcome was even more dramatic, since the Arabs seemed to be superior in almost every weapons category. After the initial Israeli air strike, Israeli ground troops defeated the Egyptian army, seizing the Gaza Strip and the entire Sinai Peninsula. In a still-disputed incident on June 8, the Israelis attacked an American intelligence-gathering ship, the USS Liberty, sailing off the Egyptian coast. Thirty-four sailors were killed and 164 wounded. Some writers insist that this was a deliberate and premeditated attack; Israel continues to maintain that the attack on the Liberty was a case of mistaken identity and an accident. Israel apologized and later paid $3 million in reparations for the families of the victims to the U.S. government, which accepted Israel’s explanation and apology. Israel asked King Hussein to stay out of the war and assured him it would not attack him first. Hussein, however, was badly misled by the Egyptians, who intimated that they were being successful against Israel on the southern front. Jordanian guns began to fire from across the borders in Jerusalem while Jordanian troops seized the UN headquarters in no-man’s land. This was indeed the excuse the Israelis needed to take the Old City of Jerusalem and the entire West Bank. Israel then turned toward Syria, which had been attacking Israel’s northern settlements by air and with artillery. Although the United Nations called for a cease-fire, the Israelis did not stop until they had captured the Golan Heights in some of the fiercest fighting of the war. By June 10, 1967, six days later, the war was over. In 1401 the great Islamic historian Ibn Khaldun (1332–1406) was in the city of Damascus, then under siege by the mighty Tamerlane. Eager to meet the famous conqueror of the day, he was lowered from the walls in a basket and received in Tamerlane’s camp. There he had a series of conversations with a ruler he described (in his autobiography) as ‘one of the greatest and mightiest of kings . . . addicted to debate and argument about what he knows and does not know’. Ibn Khaldun may have seen in Tamerlane the saviour of the Arab–Muslim civilization for whose survival he feared. But four years later Tamerlane died on the road to China, whose conquest he had planned. Tamerlane (sometimes Timur, or Timurlenk, ‘Timur the Lame’ – hence his European name) was a phenomenon who became a legend. He was born, probably in the 1330s, into a lesser clan of the Turkic-Mongol tribal confederation the Chagatai, one of the four great divisions into which the Mongol empire of Genghis (Chinggis) Khan had been split up at his death, in 1227. By 1370 he had made himself master of the Chagatai. Between 1380 and 1390 he embarked upon the conquest of Iran, Mesopotamia (modern Iraq), Armenia and Georgia. In 1390 he invaded the Russian lands, returning a few years later to wreck the capital of the Golden Horde, the Mongol regime in modern South Russia. In 1398 he led a vast plundering raid into North India, crushing its Muslim rulers and demolishing Delhi. Then in 1400 he returned to the Middle East to capture Aleppo and Damascus (Ibn Khaldun escaped its massacre), before defeating and capturing the Ottoman sultan Bayazet at the Battle of Ankara in 1402. It was only after that that he turned east on his final and abortive campaign. Despite his reputation as a bloodthirsty tyrant, and the undoubted savagery of his predatory conquests, Tamerlane was a transitional figure in Eurasian history. His conquests were an echo of the great Mongol empire forged by Genghis Khan and his sons. That empire had extended from modern Iran to China, and as far north as Moscow. It had encouraged a remarkable movement of people, trade and ideas around the waist of Eurasia, along the great grassy corridor of steppe, and Mongol rule may have served as the catalyst for commercial and intellectual change in an age of general economic expansion. The Mongols even permitted the visits of West European emissaries hoping to build an anti-Muslim alliance and win Christian converts. But by the early fourteenth century the effort to preserve a grand imperial confederation had all but collapsed. The internecine wars between the ‘Ilkhanate’ rulers in Iran, the Golden Horde and the Chagatai, and the fall of the Yuan in China (by 1368), marked the end of the Mongol experiment in Eurasian empire. 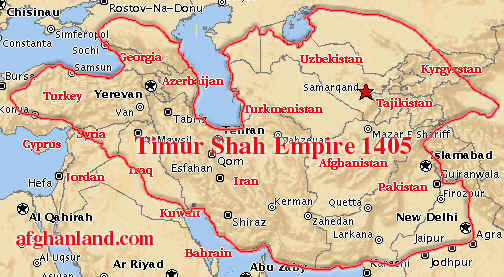 Tamerlane’s conquests were partly an effort to retrieve this lost empire. But his methods were different. Much of his warfare seemed mainly designed to wreck any rivals for control of the great trunk road of Eurasian commerce, on whose profits his empire was built. 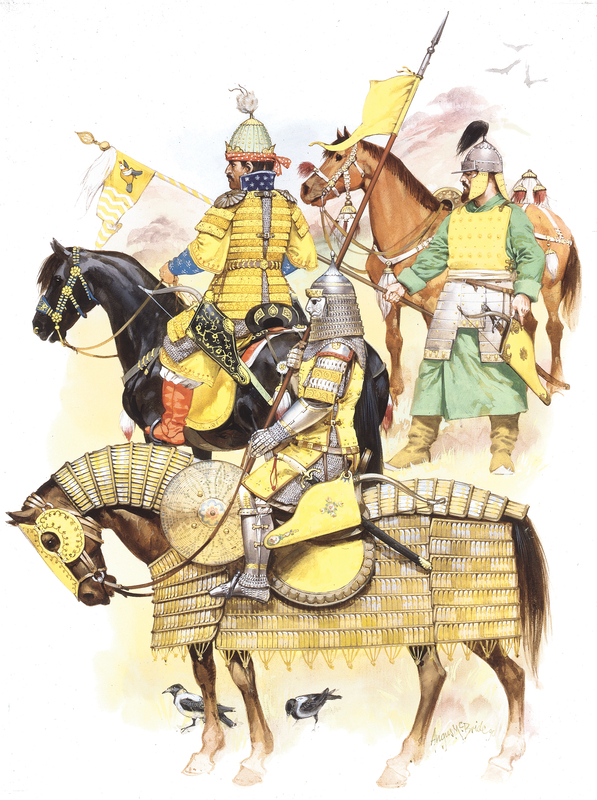 Also, his power was pivoted more on command of the ‘sown’ than on mastery of the steppe: his armies were made up not just of mounted bowmen (the classic Mongol formula), but of infantry, artillery, heavy cavalry and even an elephant corps. His system of rule was a form of absolutism, in which the loyalty of his tribal followers was balanced against the devotion of his urban and agrarian subjects. Tamerlane claimed also to be the ‘Shadow of God’ (among his many titles), wreaking vengeance upon the betrayers and backsliders of the Islamic faith. Into his chosen imperial capital at Samarkand, close to his birthplace, he poured the booty of his conquests, and there he fashioned the architectural monuments that proclaimed the splendour of his reign. The ‘Timurid’ model was to have a lasting influence upon the idea of empire across the whole breadth of Middle Eurasia. But, despite his ferocity, his military genius and his shrewd adaptation of tribal politics to his imperial purpose, Tamerlane’s system fell apart at his death. As he himself may have grasped intuitively, it was no longer possible to rule the sown from the steppe and build a Eurasian empire on the old foundations of Mongol military power. The Ottomans, the Mamluk state in Egypt and Syria, the Muslim sultanate in northern India, and above all China were too resilient to be swept away by his lightning campaigns. Indeed Tamerlane’s death marked in several ways the end of a long phase in global history. His empire was the last real attempt to challenge the partition of Eurasia between the states of the Far West, Islamic Middle Eurasia and Confucian East Asia. Secondly, his political experiments and ultimate failure revealed that power had begun to shift back decisively from the nomad empires to the settled states. Thirdly, the collateral damage that Tamerlane inflicted on Middle Eurasia, and the disproportionate influence that tribal societies continued to wield there, helped (if only gradually) to tilt the Old World’s balance in favour of the Far East and Far West, at the expense of the centre. Lastly, his passing coincided with the first signs of a change in the existing pattern of long-distance trade, the East–West route that he had fought to control. Within a few decades of his death, the idea of a world empire ruled from Samarkand had become fantastic. The discovery of the sea as a global commons offering maritime access to every part of the world transformed the economics and geopolitics of empire. It was to take three centuries before that new world order became plainly visible. But after Tamerlane no world-conqueror arose to dominate Eurasia, and Tamerlane’s Eurasia no longer encompassed almost all the known world. Reappraisals of War Plan Orange in the second half of 1933 brought to a head the destiny of the flying boat. Rear Admiral Joseph “Bull” Reeves, a faithful believer in the type, insisted that the fleet could not enter Philippine waters nor even loiter in the Marshalls without a security umbrella of five to seven VProns. Op-12 dutifully incorporated them in the first attack wave. They could fly to the Marshalls via Johnston Island but would have to travel onward to Mindanao as deck cargo. Mobilization tables reserved space aboard all ship classes, yet many of the big planes were to be lashed precariously on minesweepers under tow. The absurdity of the “eyes of the Fleet” wallowing blindly along the dangerous passage helped discredit the “Through Ticket” once and for all. In October 1933 the credibility of a mid-ocean campaign suddenly brightened. An excellent VP prototype had emerged from successful commercial types “flying down to Rio.” The Navy placed orders for the plane that evolved into the most-produced flying boat of all time, the Consolidated PBY, later dubbed Catalina for an island near the factory in California—a British practice of naming planes. The aerodynamically clean, high-winged monoplane soon achieved the long-sought 1,000-mile range—1,500 in some wartime models. War planners could look forward to delivery within three years of flocks of far-winging scouts for an ocean offensive. Rebirth of the cautionary campaign plan after 1933 owed much to enchantment with the graceful Catalinas. Yet their arrival touched off four disputes among the war planners, operating commanders, and the naval bureaus as to their roles. Three of the disputes were decisively settled before war in the Pacific erupted. Confusion over the fourth had much to do with the tragedy of 7 December 1941. The first dispute concerned whether the Navy should acquire as many Catalinas as possible as the workhorses of the fleet, or strive for even larger, more proficient aircraft. Projected numbers of flying boats for a Treaty Navy were modest: 184 operating with the fleet in 1935, with 30 added per year to reach a peak of 330 in 1941. But aeronautical science was advancing rapidly. The Navy funded design studies of what became the two-engine Martin Mariner, which surpassed the Catalinas in speed and altitude and usurped the key scouting role midway through the war. Giant Sikorsky and Martin civilian flying boats operated by Pan Air, and German and British models inspired the four-engine PB2Y Coronado, ultimately built in smaller numbers. In the extreme, the monstrous Martin Mars, an eight-thousand-mile range “flying dreadnought” was supposedly capable of a Hawaii-Tokyo round-trip. Only a handful were built late in the war. In 1935 the CNO skeptically inquired whether planes of, say, five- to six-thousand-mile ranges were needed. They required long, smooth waters for takeoffs. They consumed much more fuel. They could not be carried aboard ship and cost was a major consideration. He preferred “mid-sized” Catalinas capable of haul-out on primitive shores on their own beaching gear, for service by small tenders, or carried as deck cargo or disassembled to Mandate’s lagoons beyond their range. The Commander of Aircraft Base Force thought the ideal to be a two-engine craft of 3,000 nautical miles range at 175 knots, 20,000-foot ceiling, takeoff in less than 2.5 miles of taxi lane. CinCUS Reeves and Chief war planner, Rear Adm. William S. Pye, hoped for 3,500-mile range and thirty-hour endurance. Rear Admiral Ernest J. King, Chief of BuAer, who usually championed the most excellent aircraft, agreed quantity over “utmost” quality in this case. Why was extra range needed when no naval battle had ever been fought more than a thousand miles from land? Besides, bigger planes would not be available in masses for three or four years. There the matter rested until 1940. In February 1941 PBYs were in service (all earlier types having been retired) with 200 PBY-5s on order for rapid delivery. Only 21 PBM Mariners were on order. The General Board declared for only a few giant boats for a few extraordinary missions. Rear Admiral John Towers felt that a dozen four-engine giants would suffice; at a cost of $926,000 the Navy could procure 9 Catalinas or 4 Mariners (albeit the newer planes had not achieved cost benefits of volume production). The final prewar word was pronounced by Rear Admiral Richmond K. Turner, Chief of the WPD, in November 1941. The war in Europe showed that seaplanes could not match landplanes in range, ceiling, maneuverability, speed, or self-defense. For long-range patrolling the Navy needed big landplane bombers, 25 percent immediately and 50 percent ultimately. In a second debate, enthusiasts of the wondrous Catalinas envisioned them as a striking force hurling bombs and torpedoes at Japanese fleets and bases. The planes were performing splendidly in exercises out to U.S. atolls. Navy leaders’ enthusiasm may seem odd but in the mid- to late 1930s nobody knew how a future air war would unfold. Leading the battle cry was Ernest J. King, an air power devotee who attended flight school in middle age and then commanded the carrier Lexington. Moffett’s death brought King to the top of the Bureau of Aeronautics. In 1935 King warned against discounting the attack role. A modern VPron could drop twenty-four tons of bombs, almost as much as the thirty tons of all planes on the two largest carriers, the Lexington and Saratoga. Such planes were “distinctly a naval weapon for use over the sea against a naval objective.” Here was an opportunity “just as positive and clear” as Army bombers over land. Like cruisers that also scouted, flying boats could also fight. Any Commander in Chief would welcome them, any enemy would fear them. To ignore such a mission would cede to the Army the most promising development in aviation. A chorus of skeptics greeted King. The CinCUS considered combat a distinctly secondary role. WPD Director Captain G. J. Meyers noted that VP scouting released carrier planes for combat. The commander of the fleet squadrons imagined Catalinas carrying four 500-pound bombs as a secondary role, but Rear Admiral Frederick J. Horne, commander of the VP squadrons, retorted that loading bombs from rafts onto wing racks was so time-consuming as to render the force impotent for attack. Pye, the next Director of the WPD, said that aerial torpedoes were too big, costly, and delicate. The naysayers conceded only peripheral missions such as attacking submarines while on patrol, mining, or night attacks on poorly defended islands, albeit sacrificing range for ordnance. Nevertheless, when King returned to the fleet to command the VProns he soon was exercising them as bombers and asking for torpedoes. Claude Bloch, the next CinCUS, continued attack training. 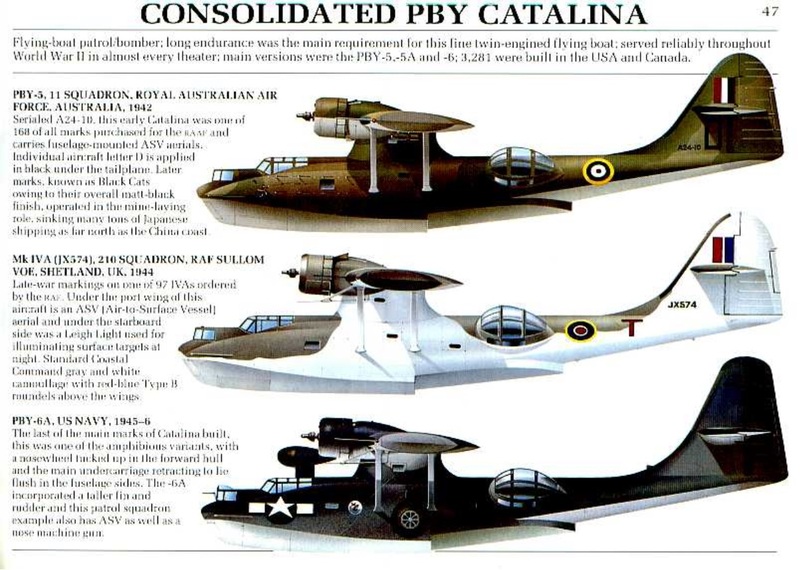 King was apparently vindicated when the Navy redesignated the Catalina “PBY,” the first seaplane to sport a “B” for bomber along with “P” for patrol. Commander in Chief Arthur Hepburn transferred them in 1937 from the defensive Base Force to a new offensive command, Aircraft, Scouting Force. By early 1940, however, opinion turned negative and soon jelled into hostility. Flying boats were inherently vulnerable. Orange Plan studies had assumed attrition of 10 percent per month, even in the scouting role. Combat raids were not worth the additional sacrifice of essential scouts. Commander of the VProns, A. B. Cook, after exercises, declared that “use as an attack forces is questionable except as a last resort,” while torpedo attacks on defended ships “should not be attempted except under desperate circumstances.” Captain Russell Crenshaw, Chief of the WPD, concurred. Richmond Kelly Turner delivered the death knell in November 1941 with his plea for long-range landplanes for the attack role as well as for scouting. A third quandary of operating VP aircraft in a Blue-Orange war involved how and where to base them far beyond the harbors of California, Panama, and Oahu. In the early stages of flying boat development some Navy officers believed they could operate effectively under the most extraordinary conditions. A few thought they might operate en masse from the open ocean, or at least in the lee of islands, if only in circumstances of utmost urgency. Experiments of refueling at sea from the specially configured tanker submarine Nautilus proved barely practicable for one or two planes at a time. An ill-advised notion to lift a VP airplane for servicing onto a cradle on the deck of a submarine that would rise to the surface beneath it was wisely squelched by acting CNO Richardson. Further experiments proved open-sea operations dangerous and impracticable (although “Dumbo” VP aircraft rescued many a downed aviator at sea during World War II). Other ideas met similar dead ends. Designs for a ship with stern gates and a ramp for hauling aboard planes with folding wings were shelved. Takeoffs were conducted using catapults mounted on towed barges that could feather into the wind, with some success in calm waters, although this left open the question of where to land on return. One outlandish scheme envisioned VP aircraft packed with Marines landing in lightly defended enemy lagoons, to defend the toehold with hand weapons until reinforcements arrived by ship. The most successful basing idea in the late 1920s and 1930s was the seaplane tender. The VProns needed sheltered harbors for flights and for ministrations by mother ships that were hybrids of fuel, repair, and barracks vessels. The Navy considered adapting merchantmen and even yachts, but settled on converting several small, slow minesweepers with lyrical names like Swan, Thrush, and Pelican. The shallow twelve-foot draft “Bird”-class tenders were well suited for uncharted lagoons. Crews could assist in hauling out VP aircraft on beaching wheels for light repairs. However, tenders were so defenseless that they might have to be evacuated during daylight hours and return after dark. Furthermore, their sluggish speed retarded fleet mobility. Working in pairs, one tender would sail off to lay moorings at an advance base while the other stood by until takeoff, then chugged gamely after. The net rate of advance was one-third that of the surface fleet. During the Depression so many tenders were laid up that movement with a war expedition was virtually precluded. By 1935, however, one large and five small tenders were serving the squadrons, with gasoline enough for thirty hours of flying. Throughout the 1930s CinCUS and General Board reports urged the development of large tenders as semipermanent homes for three squadrons, with far more fuel and berthing capacity and with cranes to lift a VP plane aboard for major repairs by its well-equipped machine shops. After every “fleet problem,” that is, massed annual maneuvers, the Commander in Chief and his aviation subordinate identified the “urgent necessity” of more and better tenders as their most important deficiency. CinCUS Reeves demanded that tenders receive highest priority. The Ship Movements Division called for four large and seven small tenders for the squadrons already in service. In 1939 the Greenslade Board’s “Are We Ready” studies again listed tenders as the fleet’s number one deficiency. The minesweeper types were slow, lacked stowage, and could handle only a half squadron. The converted destroyers cured only the speed problem. The larger types took three years to build. A new solution for both defensive and offensive VP basing early in a war appeared shortly before the actual war. For mid-Pacific operations the United States possessed a few scattered atolls west of Hawaii. Beginning in 1935 some were developed, with naval encouragement, by Pan Air for its “Flying Clipper” service to the Orient. Three atolls—Midway 1,000 nautical miles northwest of Oahu, Johnston 720 miles southwest, and Palmyra 960 miles south—were envisioned as defensive bases for Pearl Harbor. Squadrons and tenders exercised at Johnston and at French Frigate Shoals halfway to Midway. VProns made record-breaking massed flights to Midway during 1935 maneuvers. In 1938, with world tensions mounting, Congress approved a huge appropriation to develop the defensive atolls as seaplane bases—and at Midway a submarine base as well—by dredging channels through rock-hard reefs and erecting shore facilities, contracted to civilian firms that had built Hoover Dam. In 1941 ground and air defense units were emplaced on the islands. With advanced island bases in the offing the Navy ordered the PBY-5A, an amphibious version of the Catalina, to fly from airstrips as well as lagoons. By 7 December 1941 Midway housed a squadron periodically rotated, and Johnston a half squadron (six planes) from time to time. Wake Island was a different story. Situated two thousand nautical miles west of Oahu and only a few hundred miles north of the Japanese Marshalls, it was hardly a defensive outpost. 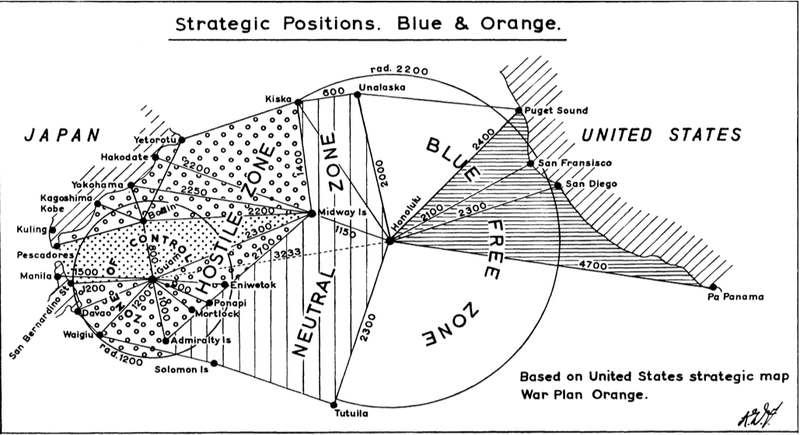 In fact, the evolving Orange Plans noted Wake’s unique value for the Blue descent on Eniwetok in the northwest Marshalls, the first objective of the offensive, to be occupied six months after the start of the war. VP aircraft could cover the fleet operating nearly a thousand miles beyond Wake. They could scout and might even bomb the Mandate Islands. B-17 bombers, staging through Midway and Wake, could certainly bomb the enemy islands. In 1940 Congress belatedly approved the funding of Wake. Meanwhile VP planes visited Wake on a few training missions by using the Pan Air channel facilities. A permanent deployment was expected in 1942. The fleet now had an advanced base from which VP aircraft could cover it as it moved into the Mandate. The hurried construction at Wake brought to a head the final, and perhaps most important, debate about the flying boats. Was their primary function defensive scouting, that is, patrolling naval bases against surprise attack? Or was it supporting the offensive as scouts fanning out ahead of the fleet’s advance across the Pacific? In the Orange Plans of the 1920s and early 1930s the defensive mission was deemed paramount because Japanese Micronesia lay undefended. U.S. forces could occupy the Marshalls and probably Truk before Japan could fortify them. The VProns’ job was to warn of a surprise Japanese counterattack on Blue ships anchored there. Security demanded continuous long-range patrols, round the clock, covering 360 degrees. The war planners expressed confidence in the protective surveillance umbrella. Offensive scouting, serving as the eyes of the fleet as it advanced, was more problematic. Carrier planes could scout ahead two hundred miles or so, and not at night. Floatplanes of battleships and cruisers could reach somewhat farther. But fleets could close on each other by five hundred miles overnight. Only flying boats could provide information of the enemy’s whereabouts a thousand miles out to sea. Unlike the clear solutions of the other quandaries before the war, planners deemed both defensive and offensive scouting vital. But in 1941 the number of VProns available to the Pacific Fleet was still small, and dwindled as some were sent to neutrality patrol in the Philippines and the Atlantic. Nearly 1,000 more aircraft were on order but were not expected in service until 1943 at the earliest. In an emergency, a Commander in Chief might have to decide which of his scouting functions, offensive or defensive, was most critical. As war loomed, Admiral Husband E. Kimmel, Commander in Chief of the Pacific Fleet, chose the wrong option. 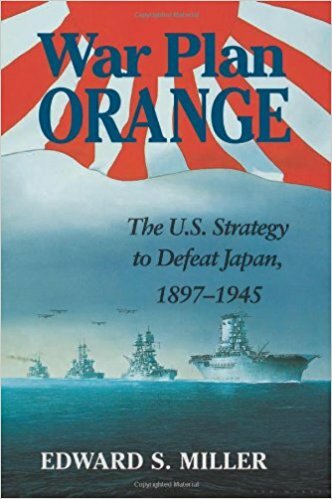 In May 1941 War Plan Orange morphed into the Pacific half of Rainbow Five, a plan for a two-ocean war against Germany and Japan adopted jointly by the U.S. and British governments. President Franklin D. Roosevelt had transferred most of the U.S. Fleet to Hawaii in May 1940 as a deterrent to Japan grabbing U.S. and Allied colonies in the Far East. In February 1941 he promoted Kimmel to command the newly named Pacific Fleet. Kimmel’s primary mission under Rainbow Five was to divert the Imperial Japanese Navy for seventy days from attacking the great British naval base at Singapore, long enough for King’s Atlantic Fleet to relieve portions of the Royal Navy so they could steam to the rescue of Singapore. However, to ensure that the offensive-minded Kimmel did not thrust too far out into the Pacific during an emergency, say, the collapse of Great Britain, thus requiring a recall to the Atlantic, CNO Harold Stark directed Richmond Kelly Turner’s War Plans Division to tether Kimmel’s range of action. His ships must not operate west of 166° 39’ E, the longitude of the Marshall Islands and Wake (although some units could cruise in the South Pacific as far as Australia). Kimmel’s planning dilemma was how to support Singapore without cruising within 4,500 miles of it! In July 1941 his brilliant war planner, Captain Charles H. “Soc” (for Socrates, his nickname because he was considered an extremely wise man) McMorris, provided the answer in Fleet Plan WPPac-46. When Japan attacked the Far East the fleet would sortie from Pearl Harbor immediately. Several flying boat squadrons would wing ahead to Midway, Johnston, and Wake to cover it. Vice Admiral William F. Halsey’s three fast aircraft carriers would steam through the Marshalls twice, first to reconnoiter and then to bomb. Meanwhile Kimmel’s eight powerful battleships would rendezvous at Point Tare, the point of maximum cover equidistant between the three atoll VP bases, then take up position between Wake and Midway. In analysis of Kimmel’s strategy the naval ballet made sense only as an elaborate ambush of Admiral Yamamoto’s Combined Fleet, presumably enticed by Halsey’s gambits to a fight in the Central Pacific. Kimmel, who “wanted to be the American Nelson,” almost certainly hoped for a gunnery slugfest about the third week of war, in waters densely patrolled by flying boats from Wake and Midway but far beyond reach of Yamamoto’s long-range scouting planes. VProns were the key to Kimmel’s grandiose plan. Plan WPPac-46 was no mere school exercise; CNO and Secretary of the Navy Frank Knox approved it in September 1941 and it was not materially amended before 7 December. Aware that the Catalinas could operate at still-primitive advanced bases for only a few weeks before engine overhauls, Kimmel opted to horde most of them on Oahu in tip-top shape for the surge forward rather than wear them out patrolling in defense of Oahu, knowing the Army Air Corps lacked long-range planes for the job. He had received a war warning. At dusk on 6 December Commander Nagumo’s carriers were about 275 miles to the north-northeast, well within the normal radius of flying boats. Kimmel had sixty-eight Catalinas in six VP Squadrons afloat and ashore at Oahu that morning, but only one was airborne guarding the harbor mouth against submarines. The Japanese attack destroyed all but one of the Catalinas. None got airborne. Assigned a nearly impossible mission, Kimmel chose to ignore base defense, the original mission for which the great planes were designed, for the more glamorous role of “eyes of the Fleet” as it steamed to the attack. He made the worst choice. Nor could Jellicoe place his faith in the measure of his crews’ competence over their adversaries: time and again in the course of the Great War the officers and ratings of the German Navy proved themselves every bit as proficient and courageous as their Royal Navy counterparts. The yawning chasm that separated the fighting skills of the British seamen of 1805 from their French and Spanish opponents did not exist in 1914. And so Jellicoe fought a very different battle, one meant to maintain the Grand Fleet’s quantitative supremacy over the High Seas Fleet and ensure that the German warships remained locked in the North Sea, utterly impotent, far from the Atlantic shipping lanes that were Great Britain’s lifelines. As Churchill so correctly observed, Jellicoe was “the only man on either side who could lose the war in an afternoon.” Thus to Jellicoe nothing but the preservation of the battle fleet mattered: all of his strategies, all of his tactics, were drawn up with this overarching requisite in mind. 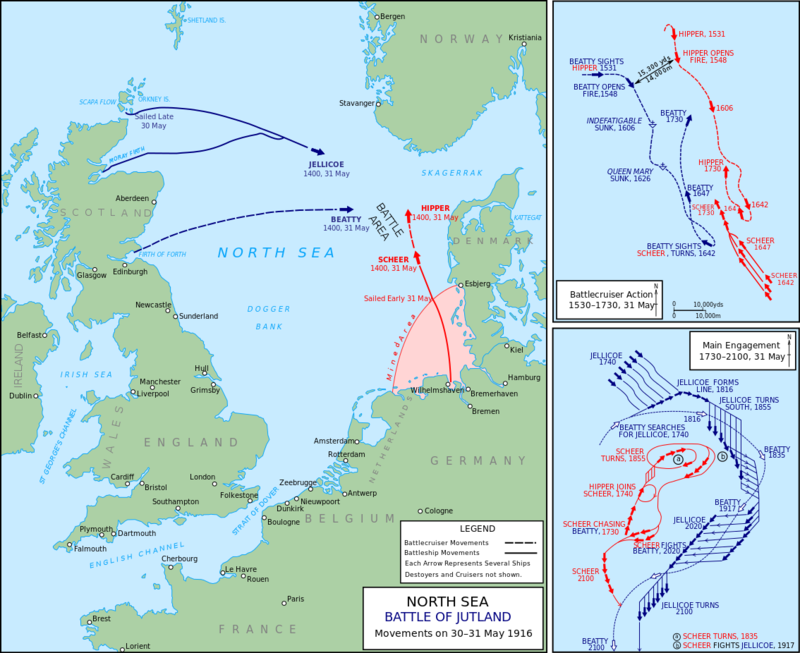 Like Trafalgar, Jutland’s consequences were not immediately felt, but they possessed a long reach and proved decisive. The myth that Jutland was somehow a German victory, or even just a draw, is simply that—a myth. For all of the bluster and posturing in his official report, Reinhard Scheer could not alter the fundamental fact that when dawn broke on June 1, 1916 the High Seas Fleet was limping back into its home port, while the Grand Fleet was cruising the open waters of the North Sea, ready to renew the battle. No amount of rhetoric or circumlocution could disguise the fact that the High Seas Fleet turned away from the enemy not once but twice within the span of an hour. If any more convincing demonstration of the Grand Fleet’s ascendency was needed, it can be found in the signals each commander sent to his admiralty upon arriving in port: Scheer told Berlin that the High Seas Fleet would require at least two months to repair and refit before it would be able to put to sea; the Grand Fleet, Jellicoe informed London, needed only to refuel before it would be ready to sail again. In the end, though, when taken in the longest view, Jutland can finally be seen for what it was—one of the decisive battles of the First World War. There is more to winning and losing a battle than simply numbers: victory or defeat cannot be determined by simply counting the killed, wounded, and missing —or in the case of a naval battle, by the number of ships sunk; it would be an exercise in superfluity to recount the major, decisive battles where the victors’ losses exceeded those of the defeated forces. Jutland was decisive not because one fleet failed to destroy the other, but because something else was destroyed: Reinhard Scheer’s faith in the High Seas Fleet’s ability to defeat the Royal Navy. After Jutland, Scheer never again advocated a major fleet action as a strategic option for the Imperial Navy. Having seen first-hand the power of the Grand Fleet, he instinctively understood that the High Seas Fleet simply lacked the strength to cripple the Grand Fleet, and that nothing less would be required if German warships were to ever reach the North Atlantic. Instead, he threw his wholehearted support behind what became the panacea of German naval strategy: unrestricted submarine warfare; so great was his newfound enthusiasm that it carried his commanding officer, Admiral Henning von Holtzendorff, with it. Scheer never fully articulated how his change of heart came about, yet the inescapable conclusion is that it was produced by his experience at Jutland. Certainly Scheer was no coward, but something broke within him that May afternoon, for he was never again the fiercely aggressive sailor he had been before the battle. Jutland disabused Scheer and his fellow admirals of any illusions they may have held about a triumphant High Seas Fleet. 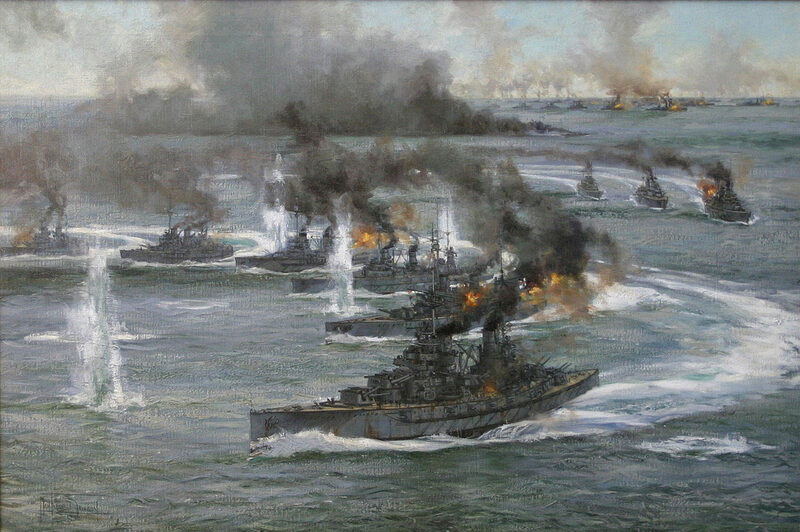 The decisive effect of the Battle of Jutland was that it drove them to choose the path of risk; in the end by accepting, even embracing, that risk, Germany paid the price in defeat. After the Battle of Jutland, almost a year passed before the United States joined the Allies in making war on Germany, nearly two and one-half years went by before that cool, brisk November morning when the warships of the High Seas Fleet steamed into internment off the Firth of Forth. And yet, when they did, they were silently confirming that for the Royal Navy, for Great Britain, and for the Allies, the Battle of Jutland had, indeed, been a victory. It had just been a distant victory.